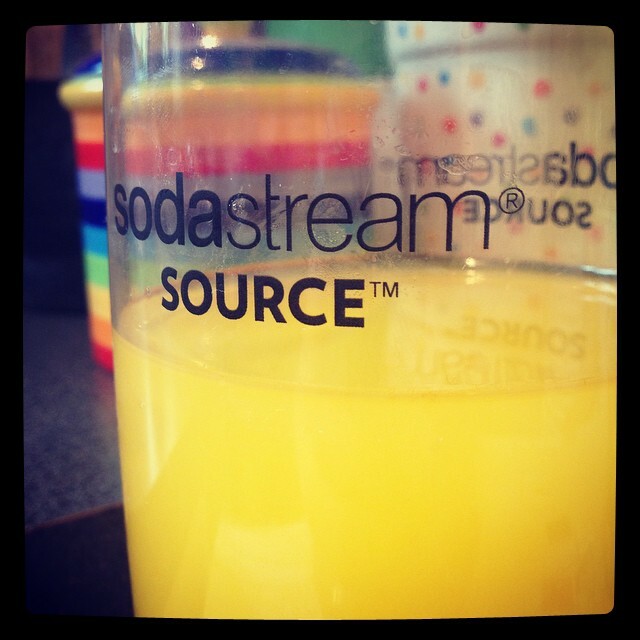 If there was one thing that I remember bringing utter glee into a trip to a friend’s house when I was a kid, it was getting to use the SodaStream machine that seemed to be an integral part of the kitchen of all of the places I might spend a day. Something about the deliciously naughty sound it made as it carbonated the drink, combined with the undeniable thrill of an unending supply of different flavours of sparkly drink – a luxury that didn’t tend to be on offer at my house – made it just feel like the height of naughty decadence. 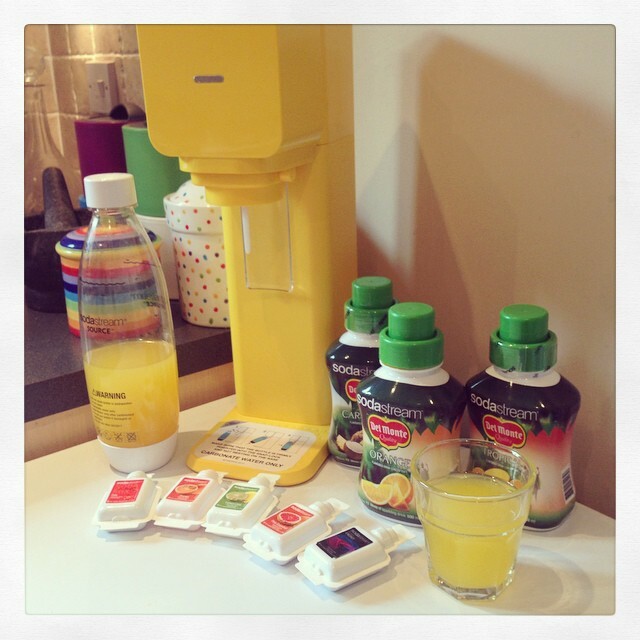 It was obviously therefore completely impossible to turn down the chance to review a new SodaStream machine, especially as it came in sparkly bright yellow. I had a feeling my girls were going to be hugely entertained by the idea of a trumping drinks machine and I have a soft spot for the company, which was originally housed in the unit I drive past every day to get to work. I also sold the house of the man who invented the method of carbonating water in this way, something that just always pleases me. (I liked him a lot, reminded me of my grandad). As predicted, the kids fell on the machine with delight. I admit I was slightly disappointed that it had a plastic BPA-free carbonating bottle, not a glass bottle like the olden days (although I see now you can get them with glass) and quite surprised by how tall it was; it is a sizable chunk of machine although this is because it accommodates a 1 Litre bottle. The starter cylinder was really easy to fit though (and makes 15L of drink after which there is a clever network of shops to swap them over with or a click and return online service) and the rounded and wipeable design does keep it nice and clean. The girls tried out the starter pack of flavours and were variably impressed by them (energy drink a bit weird, others really rather nice!) and then fell on the Del Monte fruit juice drinks we had also been sent to try out. I like that it is an option for a treat with less waste and I like that they aim to have 2/3 less sugar than a shop bought fizzy drink. My kids loved it and the only downside for me was the size, which in a small kitchen with limited cupboard and worktop space is a bit of a problem. It has a small footprint, it just feels ‘big’, if you follow me. That wouldn’t stop me recommending it, but it is a consideration. 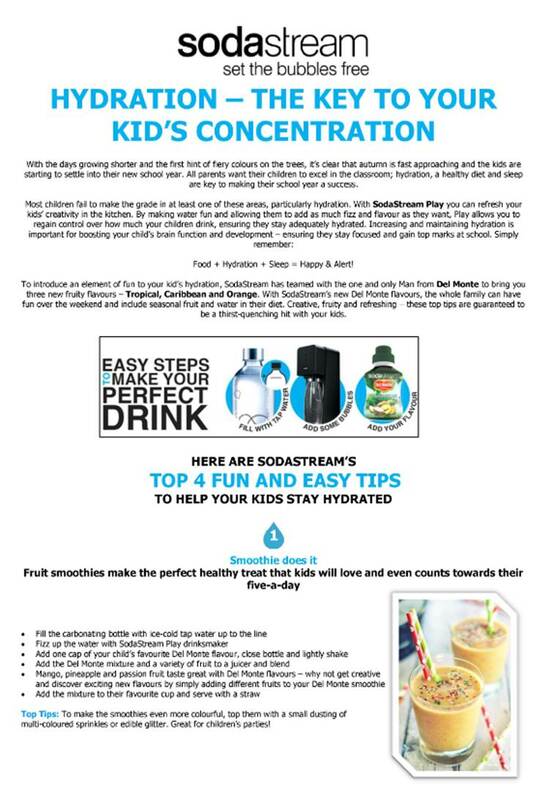 Del Monte produced a hydration tip sheet as part of the release of their SodaStream drink flavours, which is included below. Disclosure: we were sent this item for review. Thoughts are our own.